“The same boiling water that softens the potato hardens the egg. It’s about what you’re made of, not the circumstances”. This is the quote that my ‘be the egg’ mantra refers to. A mantra that helps me when the going gets tough and will hopefully help to set new LEJOG & 1,000 miles records this year. I first heard this anonymous quote while listening to Parys Edwards, a professional triathlete, on the Tough Girl Podcast. The quote really struck a note with me. In timetrialling people are often quick to blame the conditions or have other excuses ready to pin disappointing performance on. How often do you hear/see people commenting ‘the wind was too strong/weak’ or ‘the wind wasn’t in the right direction’ or ‘it was too hot/cold/busy/quiet’ or ‘I have been ill/didn’t sleep well/…fill in the blanks’. Part of what I like about time trialling is the honesty of it. It is you and your bike against the clock and the elements. Your result is your best on the day. Of course, there are situations where someone who starts say one hour before you may have slightly better conditions, but such is life and most organisers try their best to allow for women to be scheduled in one ‘block’ (which also helps the social side of things) or for the best male contenders to be scheduled not too far apart. Now, I won’t claim to have never fallen foul of this kind of behaviour. I’m sure there have been times where I have cursed the conditions. And come July/September, I know that without a favourable wind for at least part of my LEJOG route, I shouldn’t even start as I will stand little chance to beat Lynne Biddulph’s current record. The record may have stood since 2002, but that is not just through lack of trying; Lynne is a phenomenal rider and that record won’t be easy to break without at least a little help from the weather gods. How the ‘be the egg’ mantra helps me most is in choosing how to react to the circumstances. After a first recce of my LEJOG record route in early June 2016, I plan to do a second solo recce this year. I have chosen to do so in the first week of April, partly because that works out conveniently work-wise, partly because it still gives me another 6 months to learn from the recce ride and put further strategies in place. But another reason for not shying away from April is that the weather will likely be quite challenging: cold, wet (maybe even snow in Scotland?) possibly quite windy and gusty and still limited daylight. This may sound like madness, particularly when you factor in that I plan to ride it over just 3 days, riding from Land’s End to just north of Lancaster in one go (i.e. riding through the cold night), then from Lancaster to Aviemore in one go, followed by a final push from Aviemore to John o’ Groats and the additional recce of the 1,000 miles finish laps between Castletown, Thurso and Wick. It won’t be easy, but it will allow me to evaluate what the traffic conditions may be like at various tricky sections (e.g. city centres and the most challenging A-roads such as the A30, A9 and parts of the A6), around the times I anticipate to come through these areas during the record attempt in September. On the plus side, if I can manage to ‘be the egg’ and handle those challenging circumstances all on my own in April, that would give me confidence that I may indeed be able to break the record in summer, in better conditions, with more training in my legs (and mind), with a support crew and knowing there will be people to cheer me on, both online and along the side of the road. It will be all the better if, in April, I can ride at the same average speed as Lynne’s current record (excluding time to stop to buy food or refill my bottles), but let’s see; that may be wishful thinking. Completion is number one, speed is a bonus for this one. 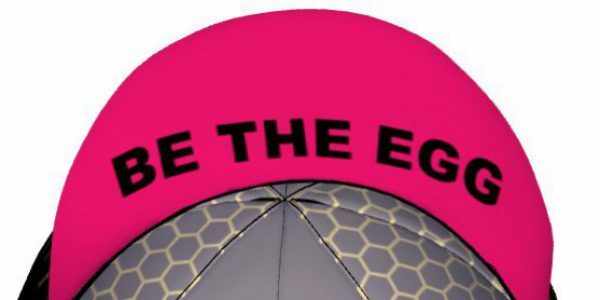 Some of you may have seen the announcement that the official LEJOG RECORD ‘BE THE EGG’ CAPS are now available to order. These high-quality, moisture wicking, unisex caps made by Owayo have a short visor to nicely fit under your helmet. On the inside of the visor there is the special message ‘BE THE EGG’, the mantra I use (and you may find helpful to) when the going gets tough. I hope the link works, but you can even see the design in 360 degrees here (use mouse to move the cap). It would be awesome to see many of these caps along my LEJOG route when I set out for the record attempt and I hope you will enjoy wearing it on your rides too. The proceeds from the cap sales will help me to finance this record attempt, as petrol, car hire, motor home hire, accommodation at the very last-minute near the start and finish for crew and officials all add up to several thousands of pounds. I am saving up as hard as I can, but I am still a while off. If I end up with more money than needed, all surplus will go to Cancer Research UK. Please understand that I need to collect a minimum number of orders before I can proceed with the manufacturing via Owayo. I hope you don’t mind waiting a little while, but the sooner you order and the sooner I hit the minimum number, the sooner I can get the caps made and sent out to you. “Thank you for sending it and for the kind words. Luckily it was my youngest (15yo) who picked the post today and, suspecting what it was, I asked her to open your letter and read it to me. She was really impressed with your record and had all kind of questions about how much you slept and how you ate, etc. She also liked the introductory sentence (“The same boiling water that softens the potato hardens the egg. It’s about what you’re made of, not the circumstances”) which she took note in her inspiring sentences notebook. Finally we ended up having a conversation about goals and determination. It turns out your pictures and note helped to inspire and give a lesson for life to my teenager. Thank you also for that”. This really touched me. I had hoped my record attempt would encourage other women to reach for the sky, which it did, just look at Jessica Belisle’s amazing 3,109km Zwift and indoor bike record over 128 hours! But it is also really great to see that my record attempt and the mantra I use can inspire people of all ages. Particularly during your teenage years, life can be complicated and it is nice to see this young girl take on some inspiration. I hope it will help her in her life, be that in sports or life in general. Thank you for the cap, the wife love’s it …. she wore it around the house all night and is suggesting that she will wear it all day at work too. Not sure how her manager will take that! Now her friend wants one … cap envy … do you have any spare?